Super Secret Sources - Stop staring and start sewing! 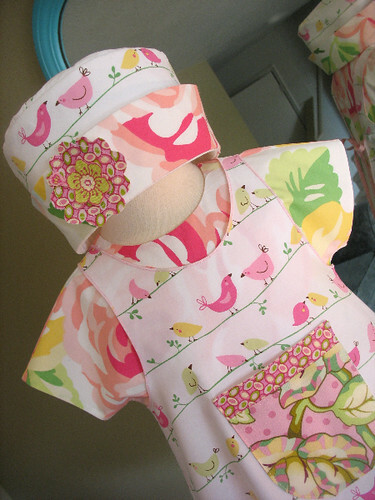 Okay, I've had a lot of readers ask me if I'm going to be carrying this cute birdie fabric in my store. Well, I'd really like to but can you spell L-A-W-S-U-I-T (I can!)? So rather than take that risk I will let you in on one of my favorite super secret sources as long as you promise to keep it a secret. Here goes: It's a sheet set from Pottery Barn Kids. It's their new Penelope line and isn't it darling??? 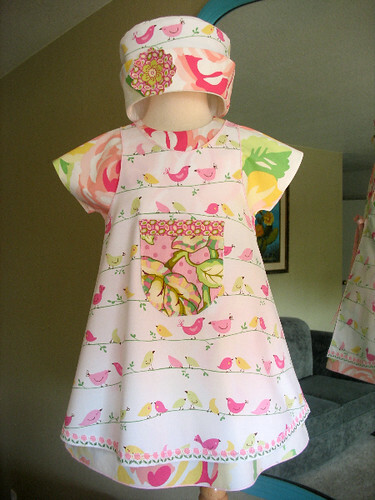 Here is an outfit I just finished and listed on ebay. 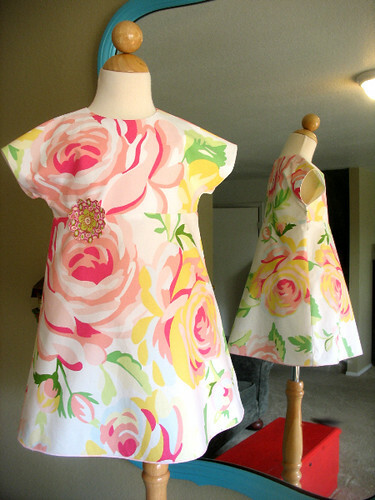 Actually the dress under the pinafore is also from a PB Kids sheet set (last spring). I really like using their sheets because they wash up very nicely and keep their crispness and bright colors. So anyway if you want to go get them it's 49.00 for the twin set and you get a lot of yardage out of that! Isn't this fabric great?! I absolutely adore this print with the big roses! I like this little hat too. It's spunky. Go forth and shop! But remember to come back when I get my store up (soon)!